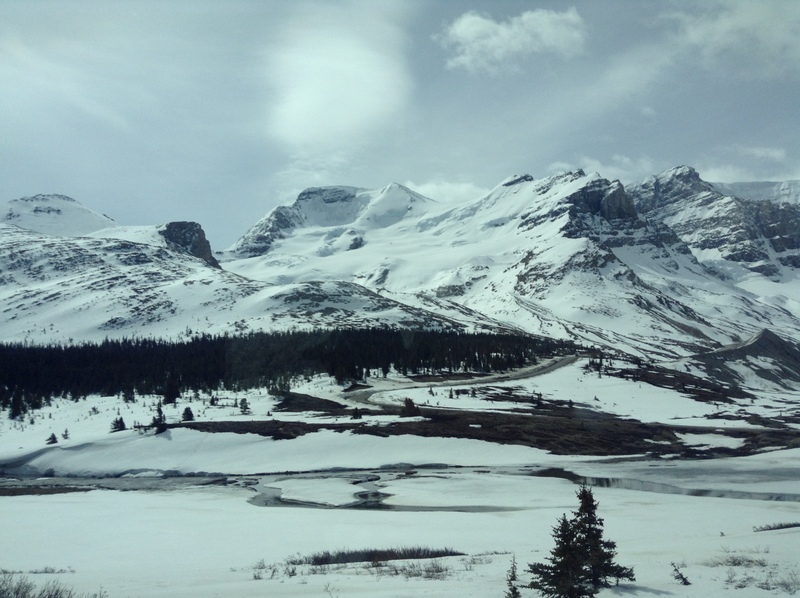 As part of our Uncommon Journeys Train Adventure across Canada, we disembarked the train after four days in Jasper, Alberta, Canada for marvelous ride through the Colombia Icefield. 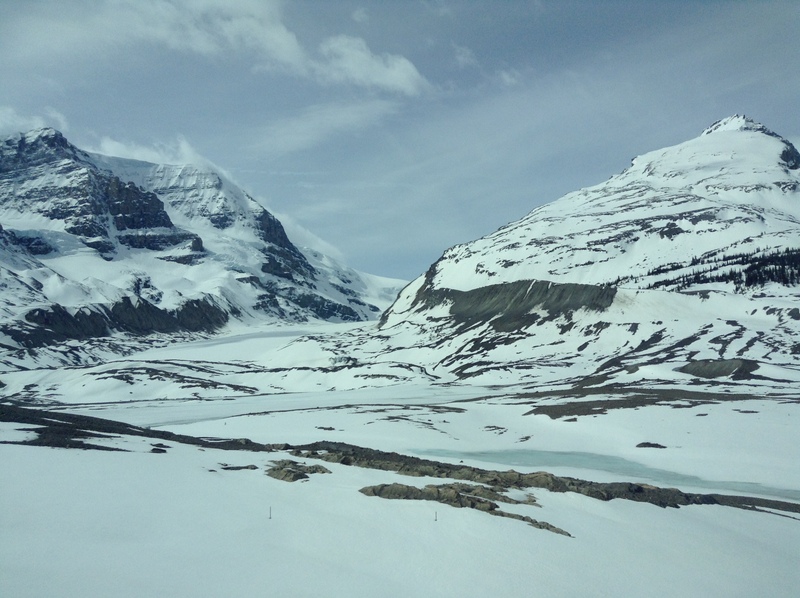 Our destination was the Athabasca Glacier in the midst of the Columbia Icefield. What a marvelous ride it was.. 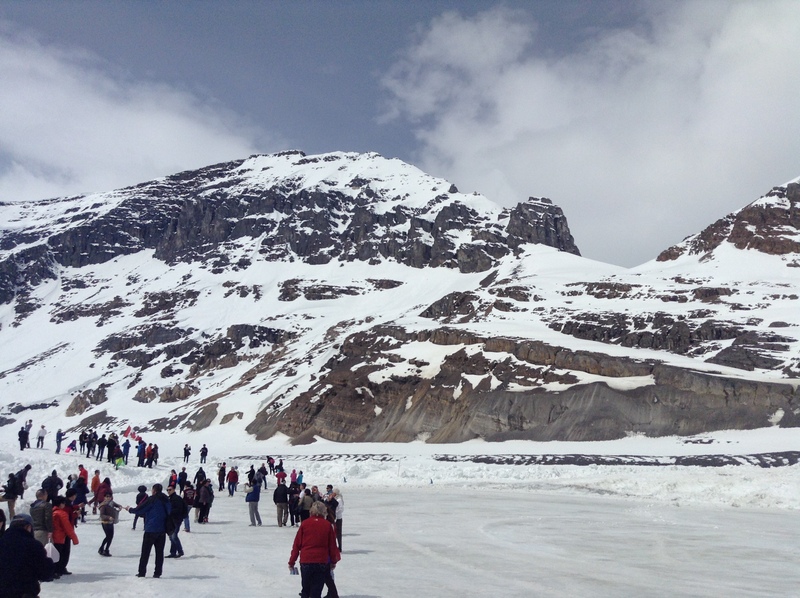 The Athabasca Glacier is one of the six principal ‘toes’ of the Columbia Icefield, located in the Canadian Rockies. 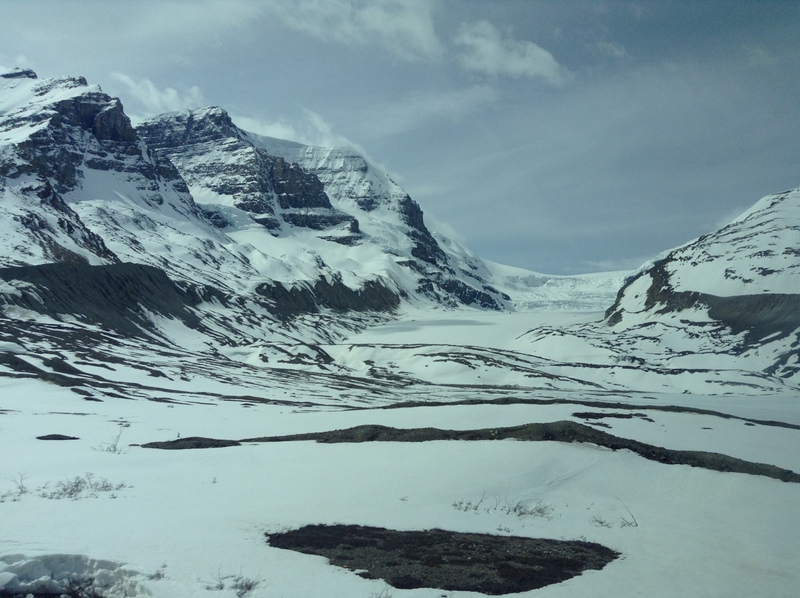 The glacier currently recedes at a rate of about 5 metres (16 ft) per year and has receded more than 1.5 km (0.93 mi) in the past 125 years and lost over half of its volume. 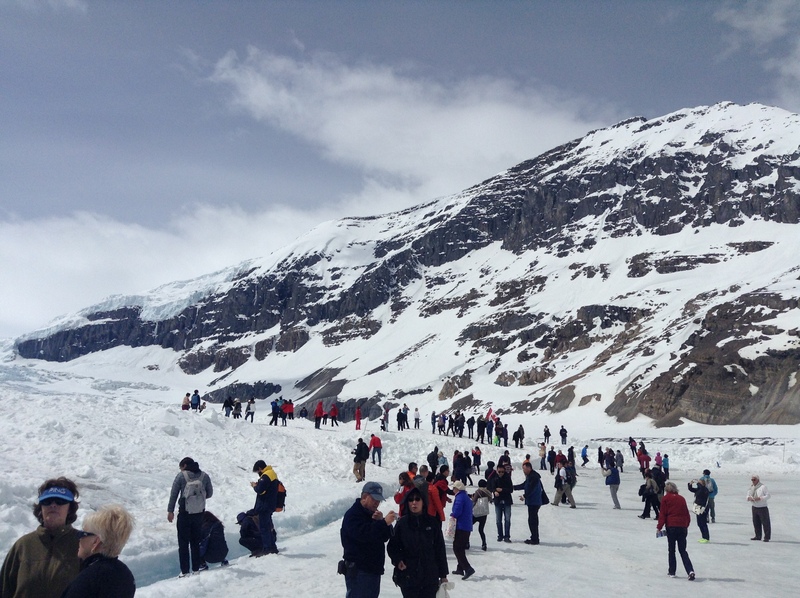 The leading edge of the glacier is within easy walking distance; however, travel onto the glacier is not recommended unless properly equipped. 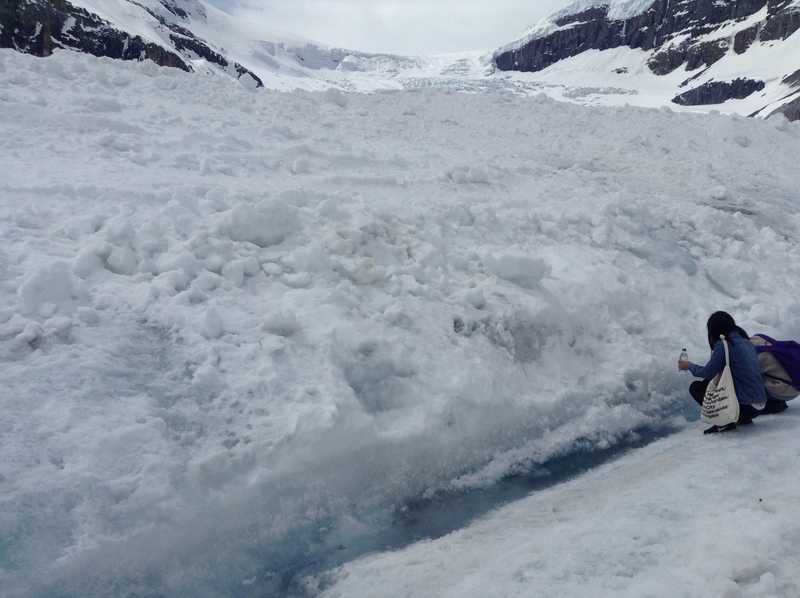 Hidden crevasses have led to the deaths of unprepared tourists. YIKERS………….we best take the bus! 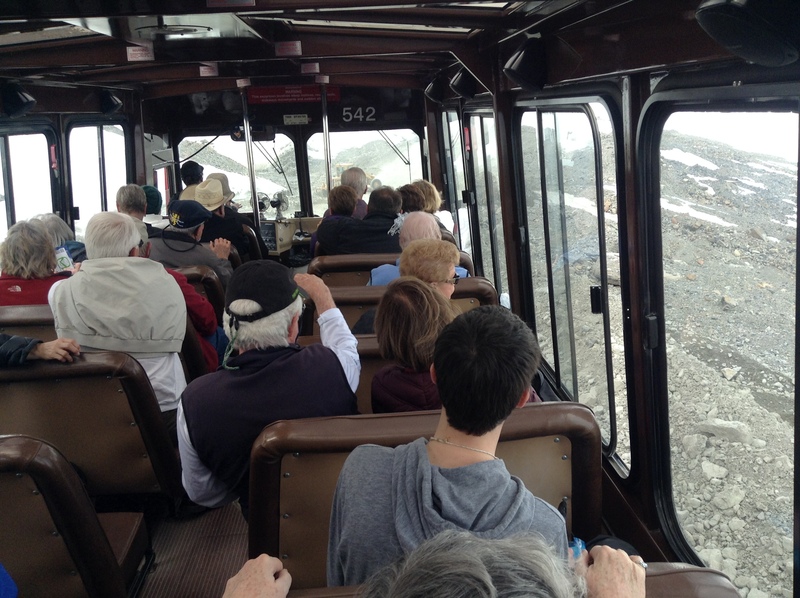 We went to the Icefield Interpretive Centre, and purchase tickets to take the Terra Bus out onto the Glacier. 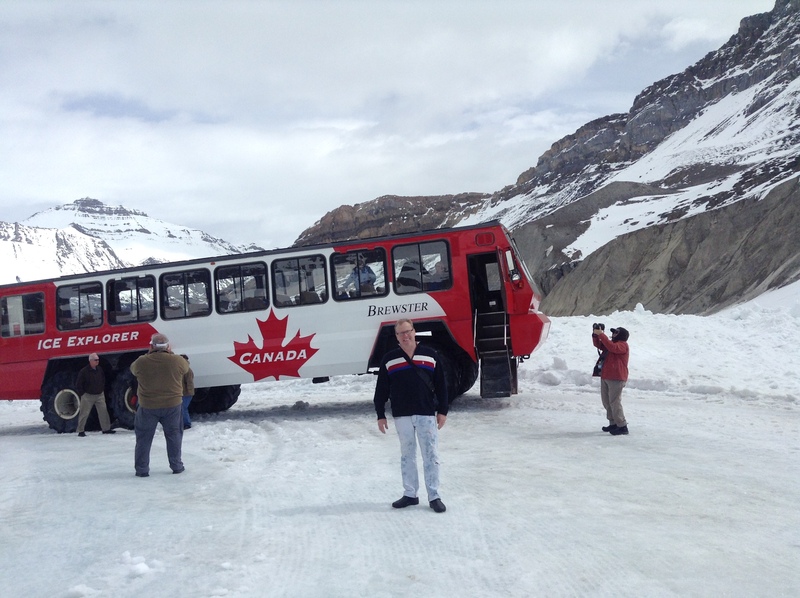 These are fantastic vehicles and the only ones in existence are here on the Icefield and in the Antarctica. 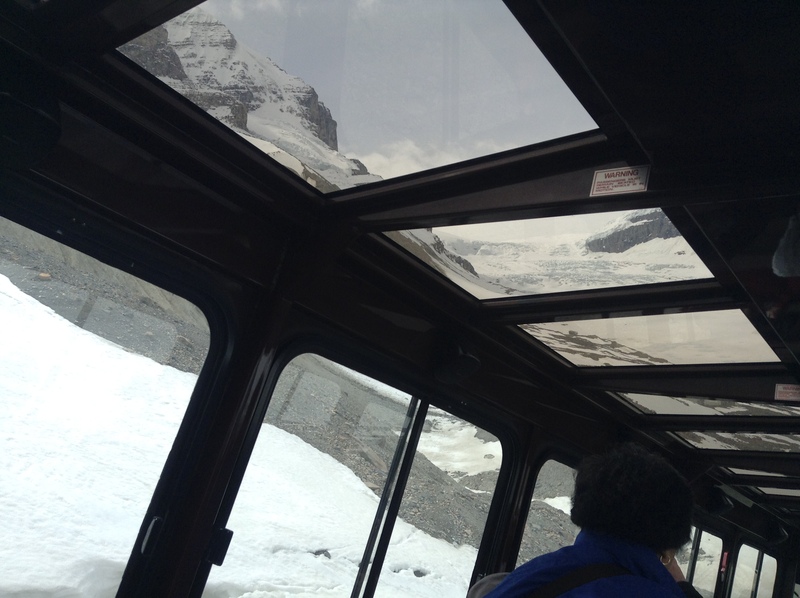 The Athabasca Glacier is surveyed each day in order to ensure that it is safe for our excursion onto its surface…. 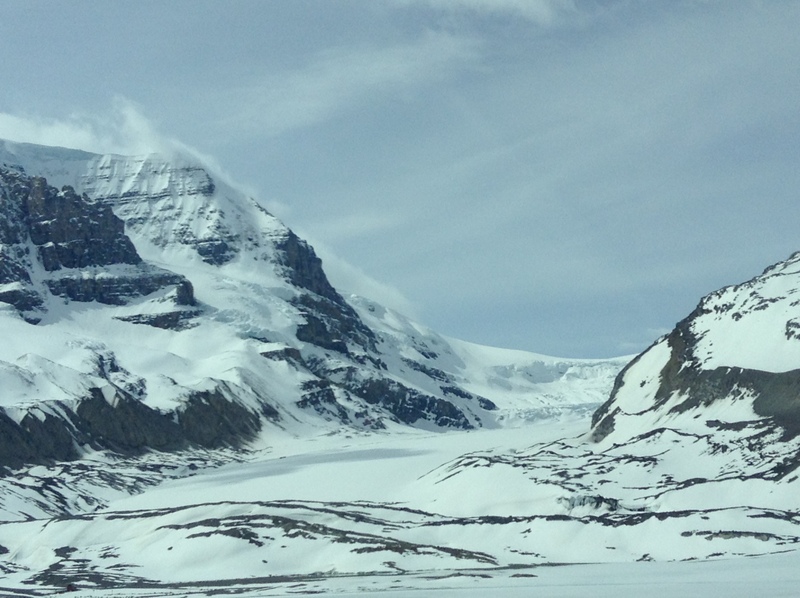 No matter the age of the individual, once upon the Glacier, we all become curious youngsters…..
As I write this post we are back at home in Texas and it is 103 degrees and the memories are most wonderful! 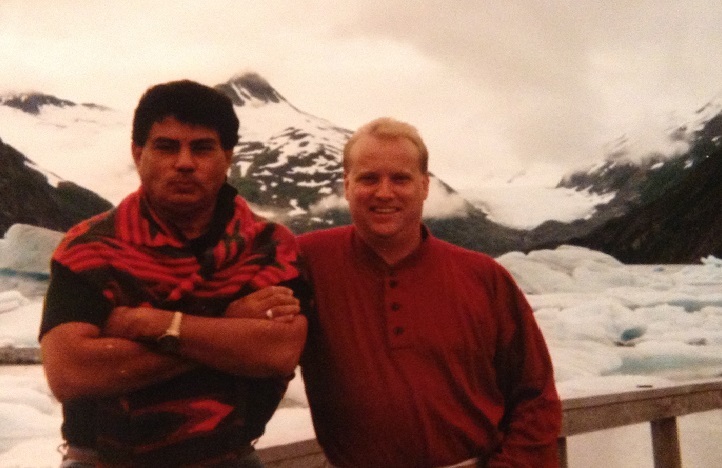 Here is a parting shot of us at Portage Glacier on the Kenai Peninsula of the U.S. state of Alaska taken in the 1990s…. Just looking at the pictures makes me feel cooler. Yes, Larry, I was thinking about you as I wrote this! How wonderful to see this post in the middle of August in Texas! 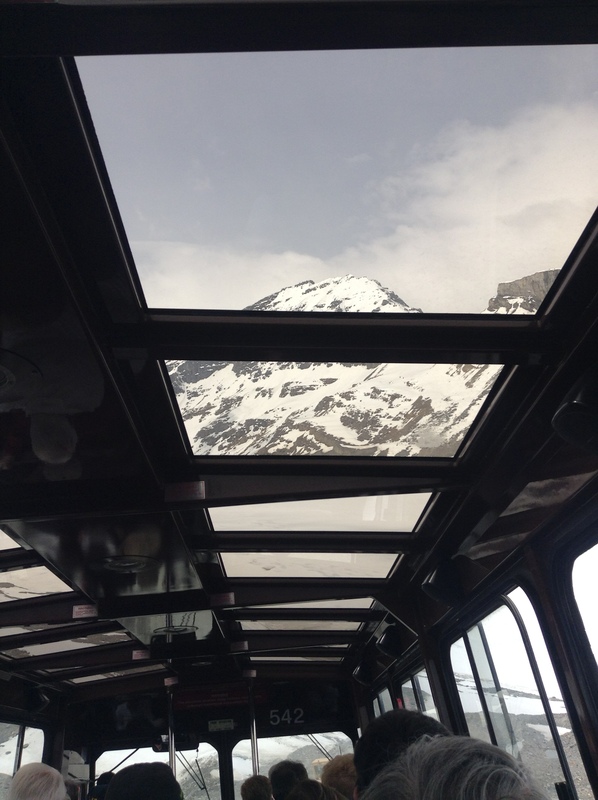 I will probably never see a glacier so thank you for taking us along on the bus. I really liked the retro photo of you and Augustine and to know that you are still together! Dearest JoNell, thanks so much for your lovely comments! As Larry said, just looking at the pictures makes us feel a bit cooler. 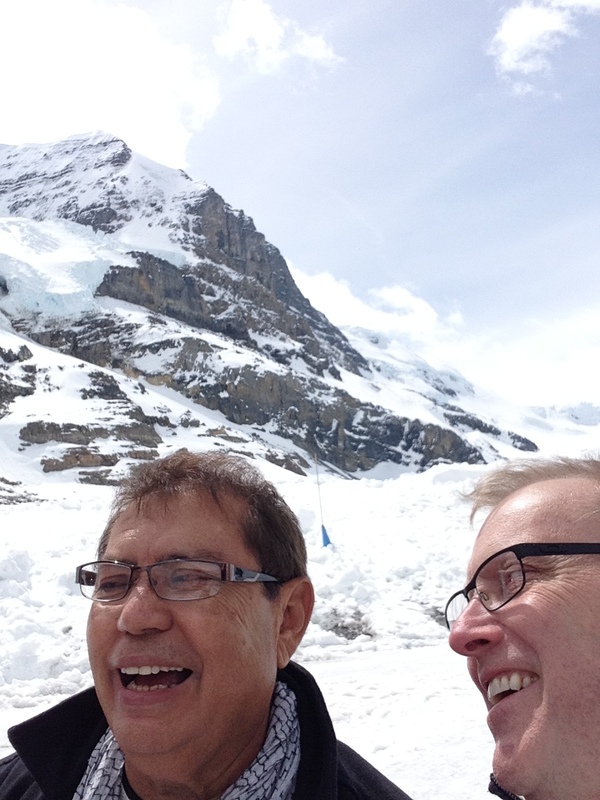 Glad you enjoyed our retro photo….we have been hopping around together since the 1970s…..40 years actually. Oh Theadora………gracious goodness…………**blush** thanks for the compliments! Yes, here in the Emerald City it is 103F so posting those pictures helped relieve the misery. 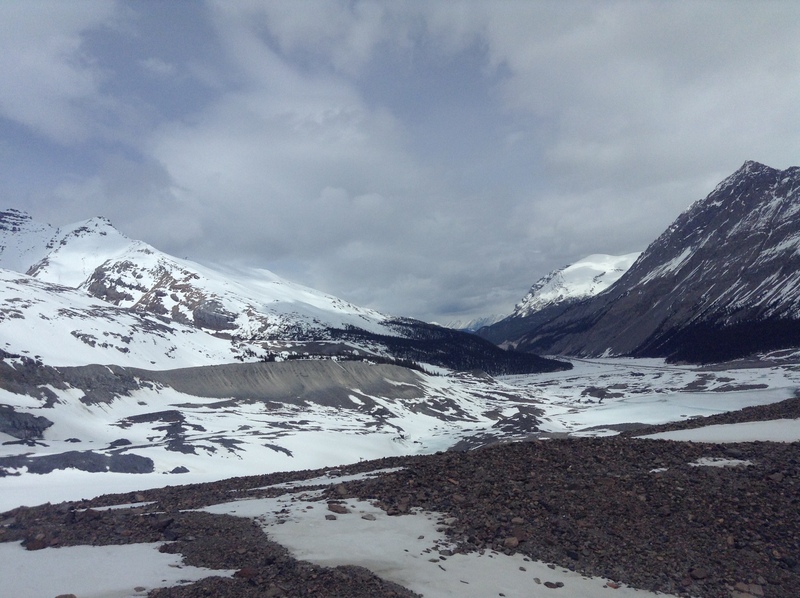 People were filling water bottles; however, I told Augustine that we would slip on the ice and land in the freezing water…….better to buy a bottle of glacier water……lol. There is no road, only a nasty little path for the monster bus to follow. Maximum speed of two miles per hour. Thanks for visiting! 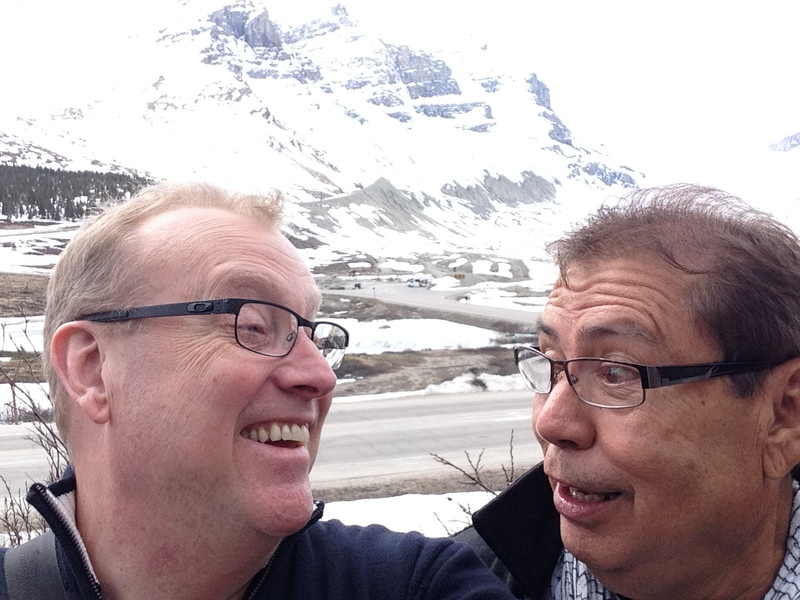 Have told everyone about your new gig……….so happy for you! I think you’re both really brave just to get on the special BUS!!!!!!! What a contrast to Texas in summer. 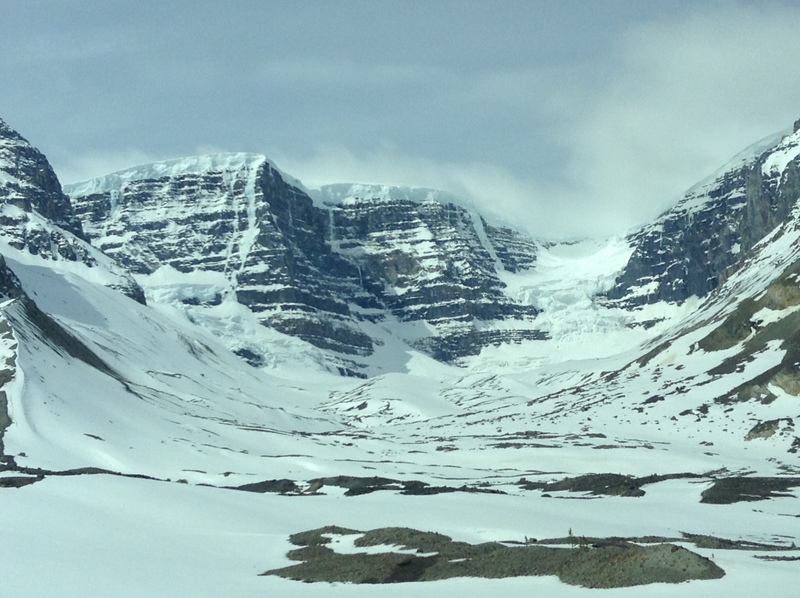 Where we live is a terrain that was scoured and shaped by glaciers advancing and then retreating. Makes it especially interesting to look out the window, then look at your photos! 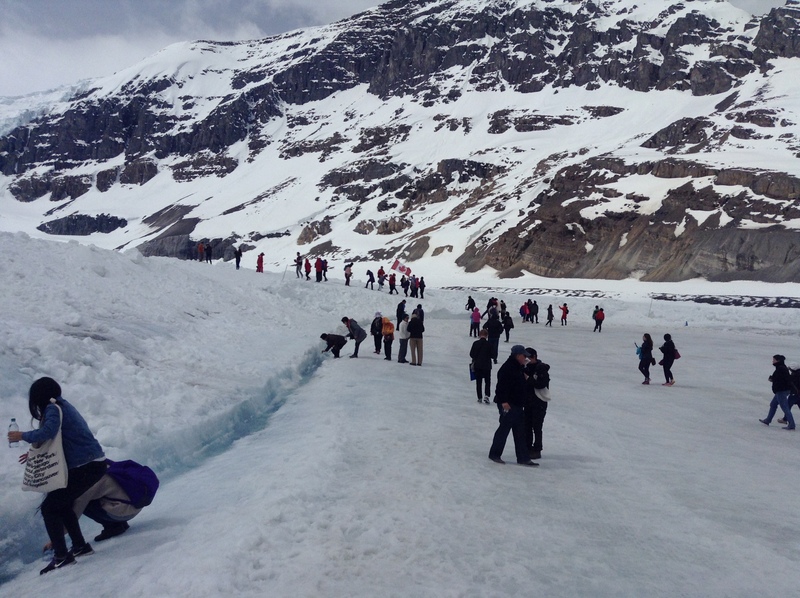 What a nice way to cool off by reliving your travels to the glacier. Our summer has been cooler than most. Only three days in the 90’s this summer and our leaves are already starting to slightly change color. 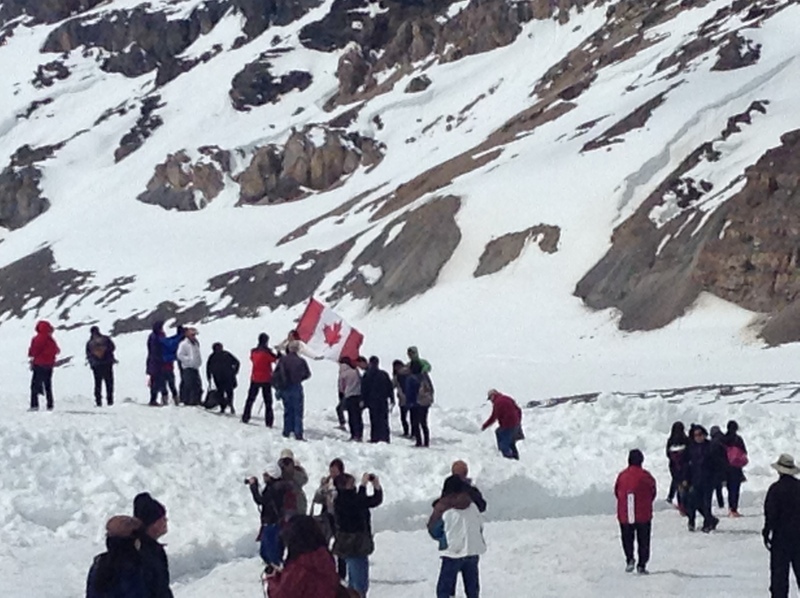 Were you throwing snowballs or building a snowman while you were there? What a nice way to cool off in the summer – wonderful pictures! We had such a delightful time! 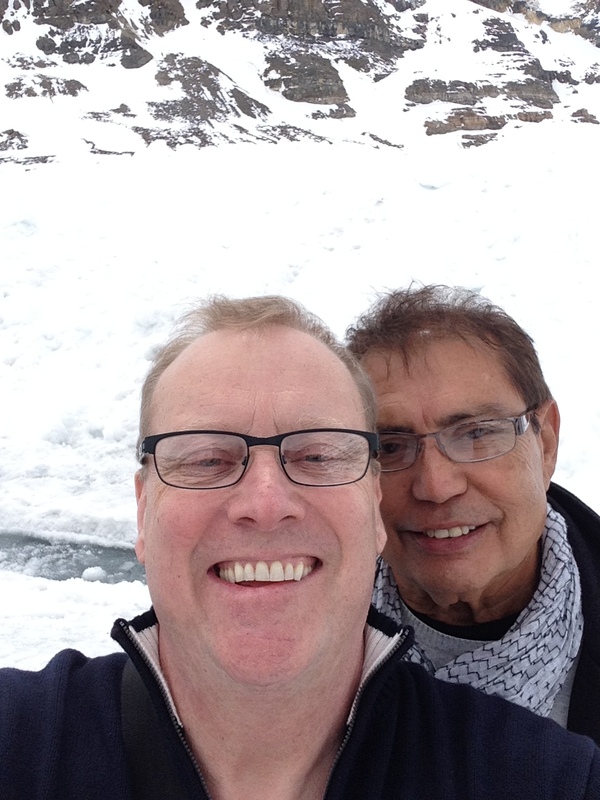 No snowballs or snowpeople……….hand in the pockets! 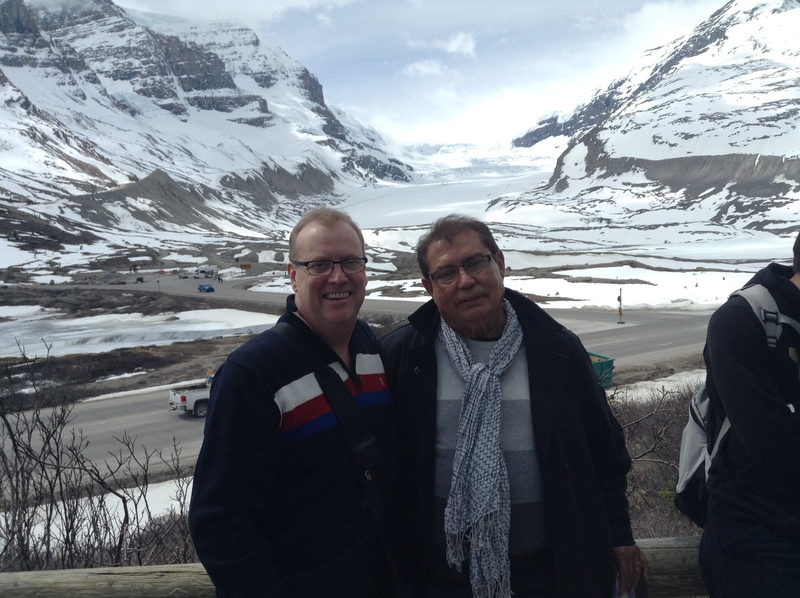 We were lucky to have a beautiful day to visit the glacier. 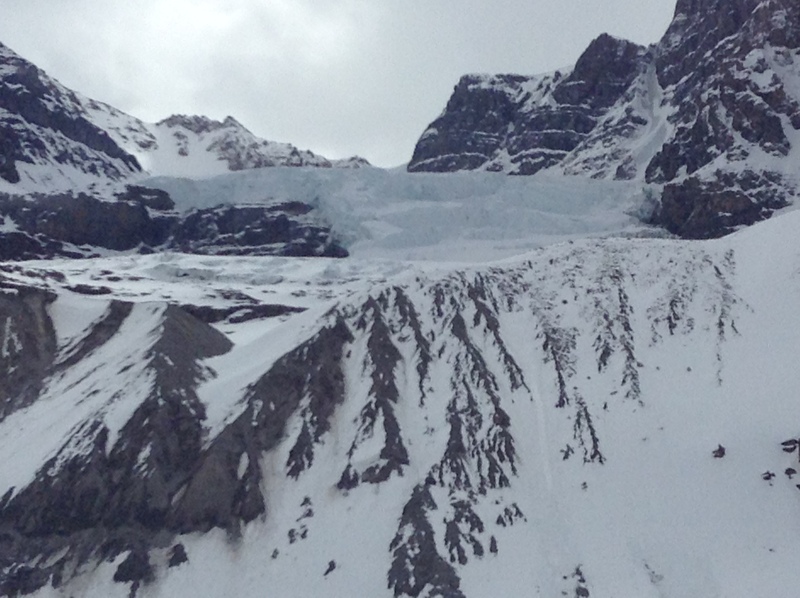 I am fascinated by glaciers. I had no idea these existed in Canada so you’ve introduced me to something new. 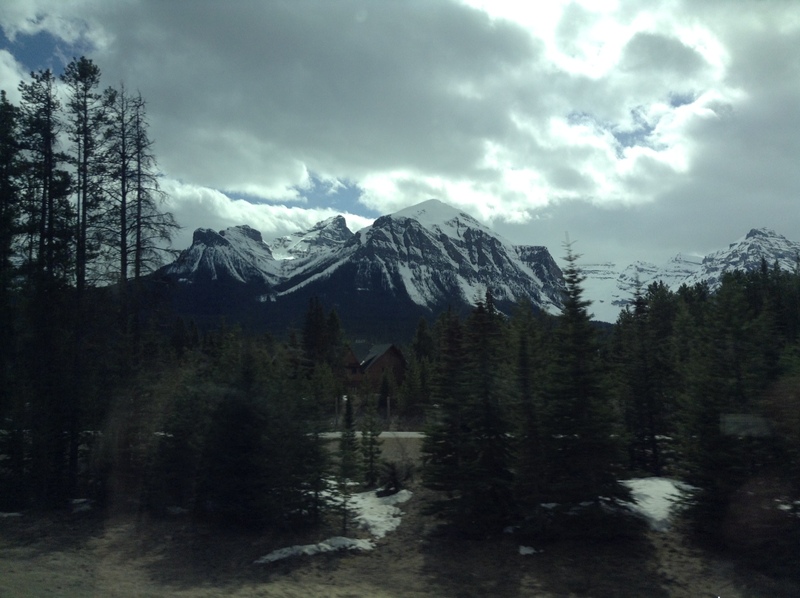 Oh, the Canadian Rockies make the U.S. Rocky Mountains look like hills. Such amazing beauty and very strict building and habitation rules, so the wild is kept intact. 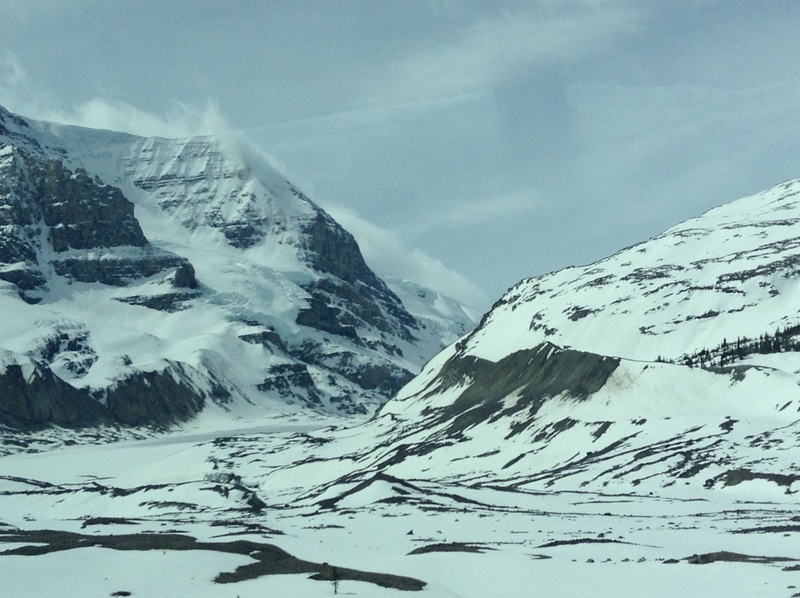 Tucked under a blanket of furs in the Snow Queen’s troika I skimmed across the glittering glacier. Peering in vain through the fog crystals I sought in vain for a sighting of The Tin Man and his inscrutable royal sidekick Augustine. I followed their trail flying over crevasses and drifting snow. A flash of red. The galloping horses struggled to overtake their chariot of many wheels. Too late. I was too late. I had missed our assignation. Three horses simply not enough to keep up with these worldly travelers. I saw you in the distance, my Queen. We reached into the sky to signal our presence, but alas the lumbering chariot of many wheels took us away! 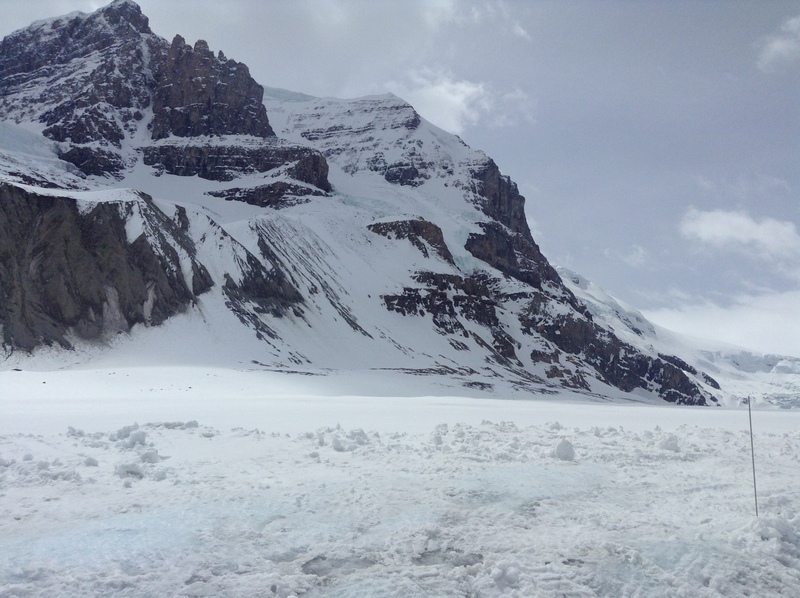 We carved a message to you in the hard packed surface of the glacier, knowing that you would attempt to reach us. It was a simple message, a Heart with and interlaced B and L ……… our paths shall cross again, my Queen.